In this type of testing the test engineer test the functionality or validation as per the expectation of software or product, the validate inputs are passed in the text fields. Error or defects are not allowed in positive testing. In this type of testing the test engineer test the functionality or validation apart from the requirements, the invalid inputs are passed in the text fields. 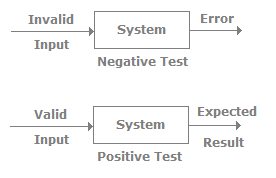 Error or defects are expected in negative testing. It is used to test the input fields and functionality in a positive manner, according to the client requirement. 1. Validate the user for entering the correct credentials for successful login. 2. Validate all the items which are listed should get clicked on view products link. 3. Validate the logged in user be able to log out the account from website and applications. 4. Validate the mobile no. Text field for 10-numeric digits apart from that the user was not able to text(Indian mobile no.). 5. Validate the search field while entering the value click on search, the user is able to search already existing data. It used for detecting the crashes or blocking in application or website for different fields and situation. 1. Validate the user for entering the wrong credentials. 2. Write the validation cases for boundary limit on text fields, the limit does not exceed more than 50-60 characters. 3. Write the validation cases on text fields, in case the field accept only alphabets apart from that if user type any other character should display an error message as: “The input field not accepted”. 4. The required field should not be empty if the data is not filled in the required field than error should generate to fill the values. 5. A most common issue which user found as the responsiveness of the application or website when the user continues the software in other devices or version the UI error is detected.